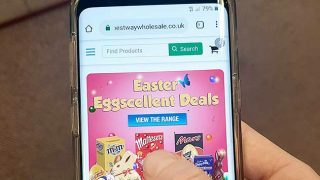 Nestlé Confectionery’s spring range for 2019 focuses on offering consumers its big brands in the season’s best-selling formats, and features new products in mini eggs, large eggs and giant eggs. Also new is Incredibles, a range of shell eggs with inclusions. In addition, Nestlé has given its full spring range a redesign, that gives each pack a recognisable and consistent seasonal look. A new nest design features centrally on the front of every pack, alongside clearer descriptions of what each contains, all aimed at communicating more clearly with shoppers. 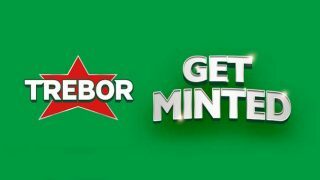 Brand new for 2019, and capitalising on the growing trend for confectionery to share with family and friends at Easter, are two new ‘more to share’ bags of mini eggs. The Smarties mini eggs bag and the Milkybar mini eggs bag are both 300g and have an RSP of £3. 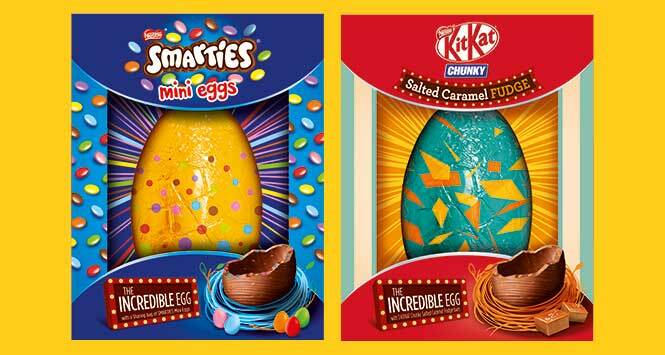 These are joined by four new large eggs, adding Smarties, Rolo, Toffee Crisp and Yorkie to the range. All have an RSP of £5.41. The new Incredible eggs each contain a chocolate egg with inclusions in the shell. From flagship brand KitKat is the KitKat Chunky Salted Caramel Fudge Incredible egg which contains a caramel flavour chocolate egg with salted caramel fudge pieces in the shell, as well as three full-size bars of KitKat Chunky Salted Caramel Fudge. The Yorkie Raisin and Biscuit Incredible egg is a milk chocolate egg with biscuit and raisin pieces in the shell, plus three full-size bars of Yorkie Raisin and Biscuit. Whilst the Smarties Mini Eggs Incredible egg is a milk chocolate egg with mini Smarties in the shell plus a Smarties mini eggs sharing bag. All three eggs have an RSP of £12. Nestle’s other big hitters Smarties and Quality Street are rolling out in the giant egg format in time for Easter. Following on from the debut of Orange Smarties in 2018 is the launch of an Orange Smarties mini eggs giant egg. This features an orange flavour chocolate egg shell as well as a bag of Orange Smarties mini eggs. This joins the Quality Street giant egg. Both RSP at £7.49. The last of Nestle’s Easter NPD is the KitKat Senses premium egg (RSP £10) which comes complete with a mixed box of the KitKat Senses chocolates to share.